I don’t know about you, but I think it looks pretty horrible. Typing it up in Latex is no fun and gave me second thoughts about writing this post, but I’ll plow ahead. First, what does it mean? One interpretation of the gamma distribution is that it’s the theoretical distribution of waiting times until the -th change for a Poisson process. In another post I derived the exponential distribution, which is the distribution of times until the first change in a Poisson process. 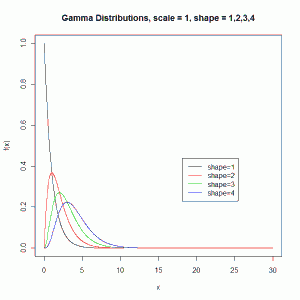 The gamma distribution models the waiting time until the 2nd, 3rd, 4th, 38th, etc, change in a Poisson process. In the applied setting (scale) is the mean wait time between events and is the number of events. If we look at the first figure above, we’re holding the wait time at 1 and changing the number of events. We see that the probability of waiting 5 minutes or longer increases as the number of events increases. This is intuitive as it would seem more likely to wait 5 minutes to observe 4 events than to wait 5 minutes to observe 1 event, assuming a one minute wait time between each event. The second figure holds the number of events at 4 and changes the wait time between events. We see that the probability of waiting 10 minutes or longer increases as the time between events increases. Again this is pretty intuitive as you would expect a higher probability of waiting more than 10 minutes to observe 4 events when there is mean wait time of 4 minutes between events versus a mean wait time of 1 minute. 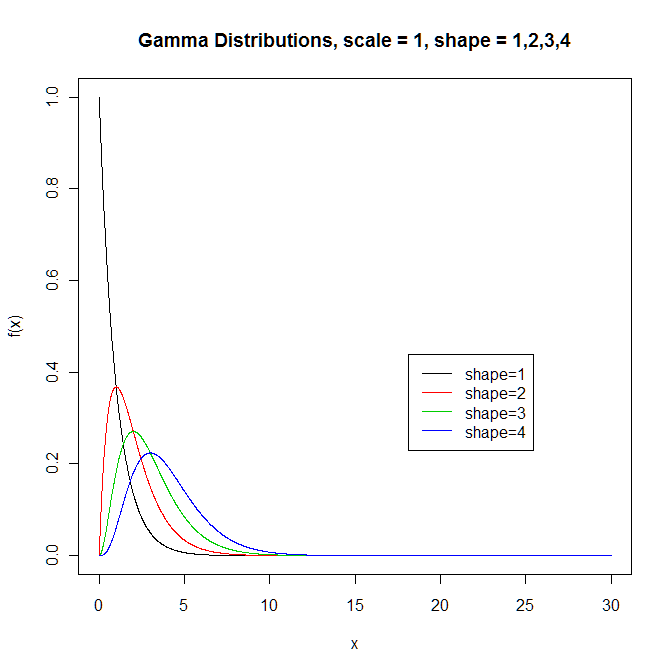 Finally notice that if you set , the gamma distribution simplifies to the exponential distribution. Update 5 Oct 2013: I want to point out that and can take continuous values like 2.3, not just integers. 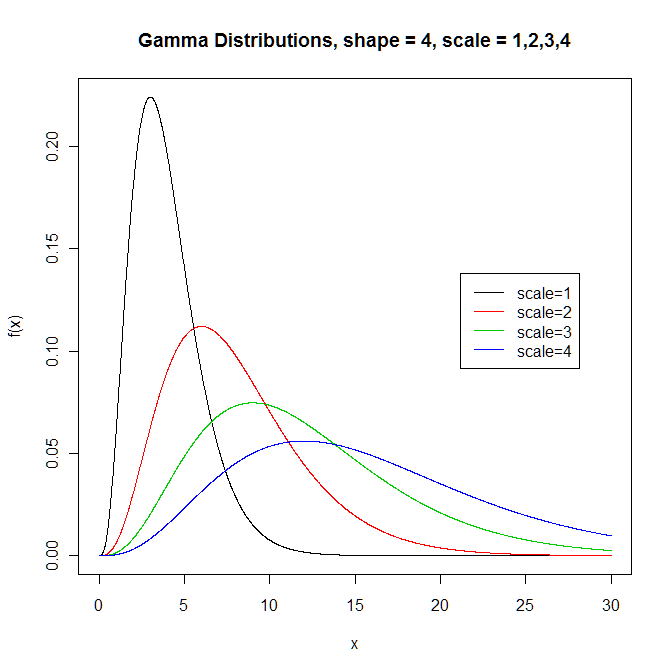 So what I’ve really derived in this post is the relationship between the gamma and Poisson distributions. This entry was posted in Continuous distributions on August 29, 2011 by Clay Ford. First of all I would like to expres my great admiration for this wonderful derivation. However, I still have a problem. This derivation is perfect for alpha is a positive integer n. For this case the gamma distribution can be described as the sum of n independent exponentially distributed random variables each with the same exponential distribution. My question now is: how would you describe the gamma distribution for a continuous alpha, 0 < alpha? You raise a good point and I realize now this post is kind of wrong. Of course alpha can take continuous values. 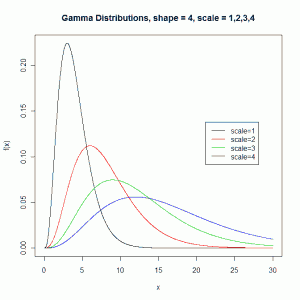 I describe the gamma distribution as if it only applies to waiting times in a Poisson process. What I should have said is something like “the waiting time W until the alpha-th change in a Poisson process has a gamma distribution.” In other words I derived the relationship between the gamma and Poisson distributions and should have clearly stated that. I will update the post accordingly in a few moments. To derive the distribution for continuous alpha, you start with the gamma function. Casella and Berger demonstrate this in their book, Statistical Inference, on page 99. Hey, this post was really helpful, thanks. In it you mention your “old statistics book”. Could you let me know the name of this book? Glad the post was helpful. The book I referred to is Probability and Statistical Inference, 7th ed., by Hogg and Tanis. Your valuable posts enables my self-learning! Thank you.